Did Matt Sheahan let his friends down? Thirty years ago, when Matthew Sheahan was 17, he nearly drowned at sea. He survived — only to watch his father&apos;s dead body drift away from the boat they were racing, never to be seen again. The Sheahans were sailing in the 600-mile Fastnet race from Cowes to Plymouth via the Fastnet rock off southern Ireland, in August 1979. Soon after they passed Land&apos;s End a furious storm arrived, wreaking havoc on more than 300 boats taking part and leading to the greatest air-and-sea rescue of modern times. Altogether, 15 race crew and six other sailors in the area were killed. Of the six men on David Sheahan&apos;s boat, Grimalkin, only four would survive. But a bitter controversy divided the survivors — controversy centred on a split-second decision by three of the crew to abandon the boat for the life-raft, leaving the others for dead. Born in 1962, he looks rather older than 47. As you would expect of a sailor, his freckled skin shows sun damage — rosy colour and large areas of flaking skin. But he also has prematurely white hair: it&apos;s tempting, if foolish, to suggest this has something to do with his experiences 30 years ago. Father and son grew into the sport together and graduated from inland sailing on dinghies to sailing at sea on ever larger boats — so big, eventually, that they needed additional crew for their weekend-long adventures across the Channel. In 1978, David Sheahan bought Grimalkin to sail in the following year&apos;s Fastnet. A sailing club friend, Gerry Winks, 35, joined their crew and through advertising they found three others: Mike Doyle and Nick Ward, both 24, and 19-year-old Dave Wheeler. By the time of the race the six had sailed together a great deal in Grimalkin. That&apos;s not how it turned out. The race started on August 11. Two days later, winds were reported at force 6, with gusts of force 7. Forecasters predicted much worse to come that night. As Sheahan describes it now, the wind rapidly shifted by more than 90 degrees, so that mountainous waves ran in one direction with other mountainous waves running across them, in an unpredictable pattern. Some of the waves were 80ft high. Worse, they were breaking at the top — dropping vast quantities of water on boats in the troughs below. First, David Sheahan tried riding Grimalkin along the waves. Then he rode across them. But it was dark, the swells were unpredictable. At one point, Grimalkin slid down the face of one wave just as another appeared in front (“like a roadblock”, Matt recalls), causing the boat to somersault through 360 degrees and chucking the crew into the water. The boat righted itself and somehow he got back on board. In some situations, the decision to call for help is easy because a single catastrophe has occurred. But sailors don&apos;t (or didn&apos;t then) issue maydays just because of a strong breeze. When the breeze becomes a storm, they struggle on and even being washed overboard several times doesn&apos;t justify packing it in. By dawn, however, everybody was cold and worn out and increasingly incapable of making rational decisions. So at six o&apos;clock David Sheahan went below with his son to radio for help. The cabin was in chaos: food, equipment, internal ballast and even joinery tumbled about freely. As David sent out his message, Matt heard a dreadful rumble and the boat did another 360-degree roll. As it came upright, he found his father slumped over the chart table, unconscious and bleeding from the head. He had been hit by a tin of food. Matt remembers cradling his father, who mumbled incoherently. “He winced as I sprayed plastic skin onto the gash. It was the last definite response I got from him,” he says. In Left for Dead, Nick Ward describes Matt at this moment as terrified: “He was distraught, his eyes wide with fear, his face pallid and drawn.” The disasters continued. The radio stopped working after the antenna broke. The flares, let off by hands numbed with cold, fired uselessly into the waves. This is when the crew started to argue about whether to launch the life-raft. Matt, the de facto skipper aged just 17 — yet to take his driving test or his A-levels — tried to consult his semi-conscious father. Then a wave turned Grimalkin upside down. Matt came to, trapped under the side of the boat by his harness, with insufficient slack to get his head above water unless — unpredictably — the waves dipped. To release his harness, he had to take off his inflated life-jacket. It was a struggle, but he managed. Then he saw Dave Wheeler nearby. “I was elated,” he says. He had assumed that he was the only one to get clear from under the boat. Meanwhile, trapped under the boat, Mike had found himself in a pocket of air and heard Matt&apos;s father shouting for help. Mike opened his knife and cut first David Sheahan&apos;s lifeline, the rope which tied his harness to the boat, then his own. When he surfaced, Mike saw Matt&apos;s father again, a few feet from the boat, shouting for help. Mike had to decide whether to swim to help David, or towards the boat. He chose survival, swimming to the boat and climbing onto the hull and, in doing so, turning the boat the right way up. There was an odd silence: the mast had broken and although the storm still raged there was no longer the terrifying noise of wind whistling in the rigging. He snapped out of it when Mike, convinced that Grimalkin was about to sink, urged him to get into the life-raft. Mike was already in, as was Dave. Nick and Gerry remained motionless in the water swilling in the cockpit. It was the most important decision Matt would ever make. “My instinct was to stay on the boat,” says Matt. “My father and I had frequently repeated the quip we had heard about stepping up to the life-raft from the masthead” — at the very last moment as it sinks. All the same, he stepped into the life-raft, which for the next hour or so spun the three men up and down the sides of the steep waves like a terrifying fairground ride. It is harrowing to read Nick&apos;s description of coming to and finding himself alone with Gerry. At first he thought Gerry was dead, but then he managed to revive him — clearing the snot and vomit from his mouth and feeling the sandpapery rasp of his whiskers as he gave the kiss of life. He prayed, and chuntered aimlessly, to keep Gerry alive for as long as he could. However, Sheahan says the coroner&apos;s report indicates that Gerry had died while the boat was upside down. Who is right? Nobody will ever know. We&apos;ve all been struck, at times, by the way our own recollection of events clashes with other people&apos;s. In a case like this, those discrepancies can cause the most terrible pain for decades afterwards. On the boat Nick successively boiled with anger at the idea that he and Gerry had been abandoned, then sank into despairing guilt at the thought that perhaps his crewmates had drowned. It did not make him exactly happy, when he was eventually rescued by helicopter, to discover that his friends were alive. Instead of rejoicing he felt — quite understandably — angry and resentful. In the immediate aftermath, Nick overcame those mixed feelings sufficiently to visit the Sheahan family, go to church with them, accompany Matt to Ireland to recover Grimalkin and even to visit the manufacturers of the life-raft with him. But gradually his suspicions drove a wedge between Nick and the other survivors. How could they leave him? Why couldn&apos;t they have felt his pulse? To which the answer, from Matt, is that “it&apos;s impossible to feel a pulse with numb fingers”. Sheahan doesn&apos;t much go in for wailing and gnashing of teeth. Perhaps sailors never do. But it&apos;s a little frustrating to listen as he skirts around the emotional highs and lows. Two years later Matt took part in the next Fastnet race, too. His boat won the Clarion cup for the best-placed British entry by handicap. Matt seems not to have noticed — or not to value — the more conciliatory passages in Nick&apos;s book. Towards the end of Left for Dead, Nick recalls talking to Matt soon after they were rescued and learning that he had watched his father&apos;s dead body drift away. “Hearing this from Matt was shocking. I really felt for him. Whoever had cut the line did it to save David&apos;s life, but in doing so there was always the risk that he would be washed away.” Impressively, aged just 17, Matt protected the identity of the crewman who had cut the lifeline. “I respected him for that,” Nick writes. Matt continued to protect Mike for nearly three decades and has gone public with the detail only after running into Mike again last year and talking it all through at length. 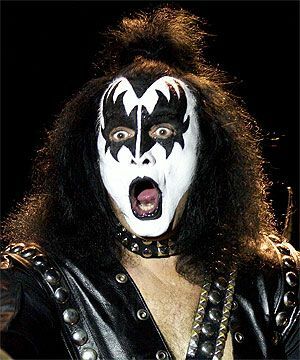 One of the greatest lessons I learned in journalism came from the rock star Gene Simmons, of KISS.